Home - URBANO PIZZA CO.
DINE IN - TAKE OUT - TAKE N BAKE Build your own or choose one of ours. Our pizzas are fast fired in under 2 minutes so stick around! Green Pepper, Tomatoes, Black Olives and Red Onions. Banana Peppers, Edam Cheese, Shoestring Potatoes and Pimento Aioli. TOP ITArtichokes, Mushrooms, Bell peppers (green, red and yellow peppers), Grilled Zucchini, Onions Jam, Red Onions, Capers, Sundried Tomatoes, Tomatoes , Pineapple, Jalapeno, Black Olives, Poached Egg, Arugula, Shoestring Potatoes, Roasted Cauliflower, Roasted Red Peppers, Banana Peppers, beets, corn, cucumber, Avocado and carrots. PICK YOUR PROTEINItalian Sausage, Pepperoni, Bacon, Piri Piri Chicken, Portuguese Chorizo, Smoked Salmon, Lamb Sausages, Mortadella, Capicollo Ham , Back Ham and Shrimp. CHOOSE YOUR CHEESECheddar Cheese, Brie Cheese, Mozzarella Cheese, Daiya – Vegan, Gouda Cheese, Edam Cheese, Goat Cheese, Feta Cheese. to take home to cook. They freeze really well, too! Edmonton, Alberta: Edmonton’s charismatic culinary duo Christian Mena and Lino Oliviera, lifelong friends and proprietors of SABOR Restaurant and Bodega Tapas and Wine Bar, are proud to announce their expansion and new shared venture Urbano Pizza Co. located in the circa-1910 Boardwalk Building at 10220 103 Street in downtown Edmonton. The notion for a new pizzeria was sparked by a growing craze in the U.S. and inspired by Mena’s daughters, budding foodies with picky palates and nut allergies. The super-fast pizza ovens — colorful and almost toy-like in design are –- personal sized, mobile and cheerful cooking marvels dishing out steamy, delicious pies limited only by maker and consumer imagination. Future off-site Urbano-catered events are being considered. These four bright and stylish ovens are the focal point of this re-designed space. The ovens allow Urbano to serve an artisanal hearth-style pizza (reaching temperatures up to 450°C) 90-120 seconds, a new standard for average wait times with quick-service cuisines. Another specialty item for the restaurant is the cherry-red authentic Italian meat slicer called an affettatrice a volano. The restored micro-pizzeria features vintage lighting, whitewashed brick and mortar, custom-made reclaimed wood tables, and a six-seat eating bar overlooking the pizza assembly space. Allendale Construction and J Interior Design helped design the intimate space for those who want to linger a little and for eaters on the move. “Our guests are sure to have as much fun imagining their favourite new pizzas, watching them bubble and sharing them with friends as we have had creating our Signatures and tooling around these ovens in our new space,” says Oliveira. Build-your-own-salads and assorted gelato options escalate any visit up to a full-on Italian three-course feast, fast. 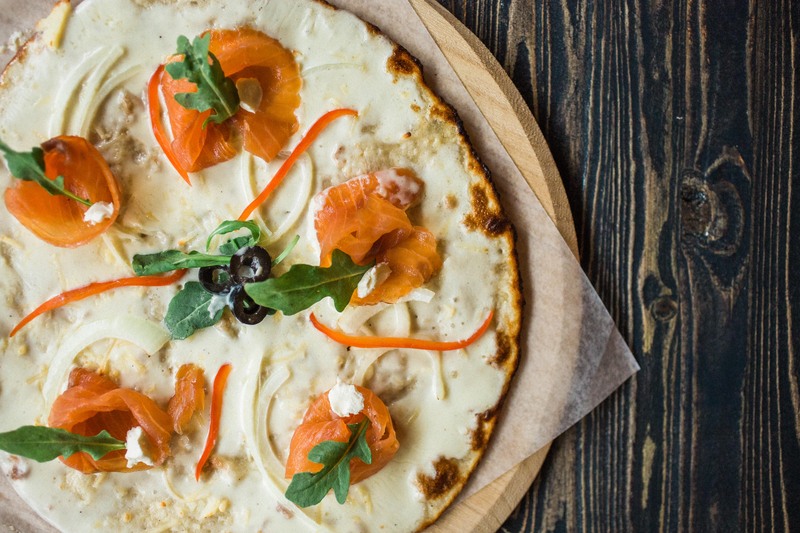 Edmonton’s charismatic culinary duo Christian Mena and Lino Oliveira, lifelong friends and proprietors of SABOR Restaurant and Bodega Tapas and Wine Bar, are proud to announce their expansion and new venture Urbano Pizza Co. The four bright and stylish ovens are the focal point of this re-designed space. and receive a FREE* regular Coke product with the purchase of any pizza! *1 per person per visit cannot be combined with any other offer. No cash value.